If you've been out on your bicycle the past few days, you know that everything is slick and crunchy, but especially the road shoulders or bike lane areas where snow and debris have been pushed and piled. I believe little snow maintenance is done to any part of a Pueblo street, but zero or negative work is done to the bike lanes. So until the weather warms up, ride slow, steady and straight, and be safe! It has been tough here up north in Jefferson County. 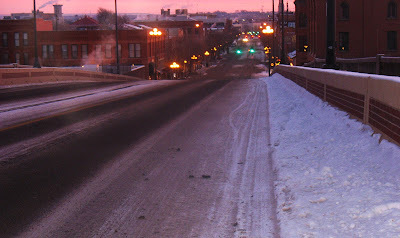 Sidewalks were not shoveled in several cities, even on public property. Sidewalks were not too bad here in Lakewood, but bike paths were not cleared and intersections were blocked by ice for both pedestrians and bicyclists. For a city like Pueblo it's probably tough to plan for snow. It's guaranteed to snow at least a couple of times a year, but it's usually gone quickly, so buying plows, paying winter maintenance, etc may not be cost effective, because of that for a couple weeks a year, bicyclists, pedestrians and motorists have to put up with slick surfaces.